Education Secretary Betsy DeVos testifies at a House Committee on Education and the Workforce on Capitol Hill in Washington. The Education Department said Aug. 23 that it is weighing whether to allow states to use federal funds to purchase guns for schools, prompting a storm of criticism from Democratic lawmakers and educators. WASHINGTON – The Education Department says it is weighing whether to allow states to use federal funds to purchase guns for schools, prompting a storm of criticism from Democratic lawmakers and educators. A senior Trump administration official told The Associated Press on Thursday that the agency is reviewing legislation governing federal academic enrichment grants to see if the money can be used to buy firearms. 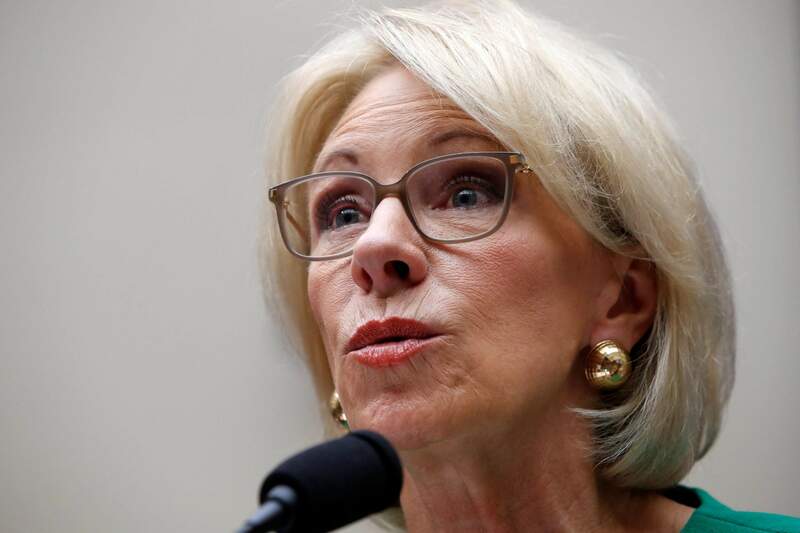 “Secretary DeVos continues to lead an anti-student and anti-teacher campaign on behalf of special interests and the NRA that rejects proven and effective initiatives to ensure a safe, welcoming school climate for children,” she said. “The Secretary of Education cares more about the firearms industry’s bottom line than the safety of our kids, and that should scare parents to death,” he said. “Instead of after-school programs or counselors, programs that are critical for creating safe and welcoming schools and addressing the mental health needs of kids, DeVos wants to turn schools into armed fortresses and make kids and educators less safe,” Weingarten said in a statement. “She wants to turn the U.S. government into an arms dealer for schools. That’s insane,” she added. “It seems very hard to imagine that members of Congress drafting Title IV envisioned that the funds would be used to arm teachers,” West said.